After a record-breaking year in 2018 for business transactions closed for clients, the attorneys of Offit Kurman’s Mergers & Acquisitions Practice Group are pleased to announce the completion their largest pair of deals to date that finalized in March 2019. Joseph M. Armstrong and Michael Petrizzo represented the AVL Digital Group in two successful transactions valued at over $240 million. 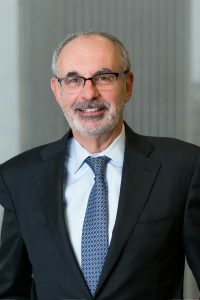 Mr. Armstrong and his Offit Kurman colleague Herbert R. Fineburg worked with the AVL Digital Group for decades prior to closing these transactions during the first week of April 2019. In the first transaction, AVL Digital Group spun off its legacy physical product divisions, Disc Makers® , BookBaby® , and Merchly, to DIY Media Group, Inc., an entity newly formed by the senior management team headquartered in Pennsauken, New Jersey. Shortly after the spinoff of the legacy physical product divisions, AVL Digital Group sold its integrated portfolio of industry-leading music distribution and artist services businesses, including AdRev®, CD Baby®, DashGo℠, and Soundrop® to Downtown Music Holdings, the parent company of Downtown Music Publishing and Songtrust®. 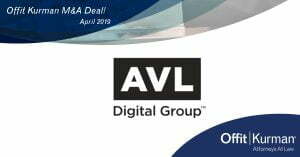 With a diverse client base of over 900,000 artists, labels and other rights holders, AVL Digital Group represents the largest independent sound recording catalog in the music industry. Collectively, AVL Digital Group’s portfolio companies distribute and monetize a catalog of over 10 million tracks across popular content streaming services, including Amazon, Apple Music, Spotify and YouTube. DIY Media Group, Inc. and AVL Digital Group’s digital distribution businesses will maintain their strategic partnership so artists can continue to easily offer their fans digital and physical products. To learn more about the current M&A market, see a recent recap of deals closed, and get in touch with an Offit Kurman M&A attorney, visit offitkurman.com. Mr. Armstrong works with a variety of entrepreneurs and business owners to help guide them in the business owning process through all stages from formation to succession planning and eventually exiting, selling or transferring the business. Mr. Armstrong leverages his extensive experience in business litigation to guide his owner-managed corporate clients through potential controversies with an emphasis on risk management and avoiding costly disruptive litigation. 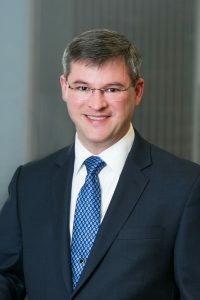 Michael A. Petrizzo, Jr. counsels and provides strategic advice to clients in connection with mergers and acquisitions, financing transactions, corporate restructurings, and general corporate and commercial matters. Mr. Petrizzo has represented public and private companies, private equity firms, and high-net-worth individuals, in complex commercial transactions across a broad range of industries, including financial services, healthcare, retail, construction, manufacturing, technology and consulting services. Mr. Petrizzo has also been retained as “outside general counsel” by several early-stage and established enterprises. 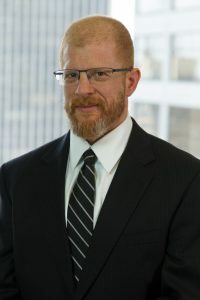 Mr. Fineburg is recognized as one of Philadelphia's most respected business lawyers whose substantial knowledge of tax law provides clients with strategic and cost-saving benefits in connection with commercial transactions, taxation and wills, trusts and estates matters. Known for his ability to resolve complicated matters effectively, Mr. Fineburg has assisted businesses and individuals with the organization of their finances, business and real estate affairs, and the structure of their assets (i.e., in LLCs, partnerships, corporations, trusts or joint ownership). He has substantial expertise in the preparation of buy-sell agreements for co-owners who are family members or unrelated business partners and has handled the resolution of shareholder and partner disputes and buy-outs. In addition, to working on bank financings, business contracts and employment matters for his business clients, Mr. Fineburg also provides advice on business acquisitions and sales.